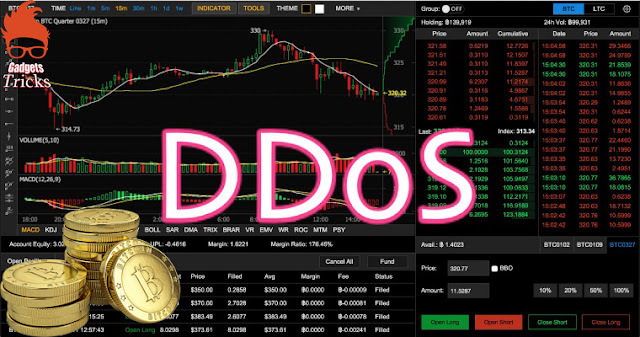 Home / CYBER ATTACK / NEWS / Vulnerabilities / Bitfinex Cryptocurrency Exchange Hit by << DDoS >> Attacks ! Bitfinex Cryptocurrency Exchange Hit by << DDoS >> Attacks ! A DDoS attack is an attempt to make an online service unavailable by overwhelming it with traffic from multiple sources. In Bitfinex case, this is the second attack in just one week. On December 4th, the company suffered significant attacks on its server that carried on for days and stopped on December 7th. Bitfinex cryptocurrency exchange hit by massive DDoS attacks? While Bitcoin’s value is up to the sky, it is no surprise that a cryptocurrency exchange like Bitfinex came under cyber attacks. Also, CoinBase, another cryptocurrency exchange with more than 13 million customers was also under DDoS attacks earlier today yet it is unclear if both attacks are related. If you are running a business calculate the cost and probability of a DDoS attack on your business with this DDoS Downtime Cost Calculator.